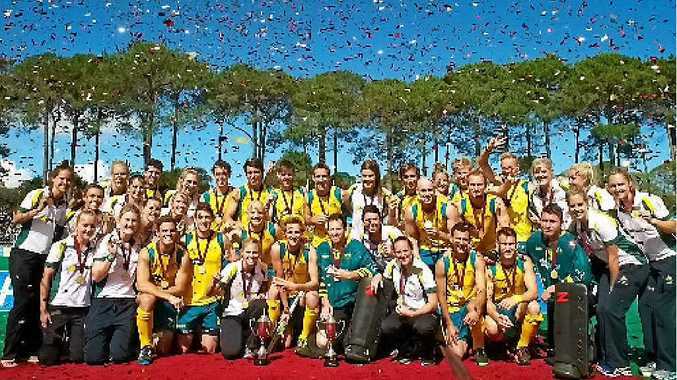 THERE'S been no rest for former Mackay player Kirstin Johnson who has jumped straight back into training a day after her team secured the gold medal at the International Super Series Hockey 9s in Perth. This week she'll join the Hockeyroos to play Canada in a home Test series in Perth. She also hopes to make selection for the Oceania Cup, which will be held in New Zealand next week. Johnson might be back on the field, but the excitement from Sunday's 3-0 win against Argentina still hasn't worn off. The Aussies managed to keep their unbeaten gold medal record for the third successive year. "We were just happy to beat Argentina teams," Johnson said. "It's always going to be tough against a team like that... they are the world number two for a reason and they are tough competition and have exceptional skills." However, she said the Argentinians were a bit undisciplined... which helped their game. "We came out really well and got on top of them straight away," she said. The Hockeyroos are currently ranked sixth in the world and Johnson hopes from here they will progress higher up the ladder. There will be two official 11-a-side tests against Canada this week, being held today and tomorrow in Perth. Next week's Oceania Cup is a qualifier for next year's World Cup in Hague. Australia has already qualified, but Johnson said every international game was a good opportunity to gain more experience.